Award winning journalist and novelist. 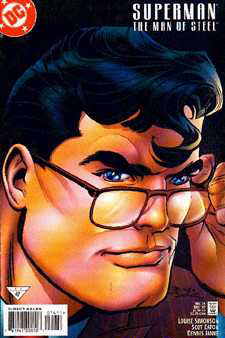 Clark Kent was born in Smallville, Kansas, where he grew up on his family's farm. He played football in high school (Man of Steel miniseries #1), Following his graduation from high school, Kent wandered the world for a while, but finally attended Metropolis University (World of Metropolis #2). He became [briefly] the protégé of world-famous journalist: Simone D'neige, in Paris. 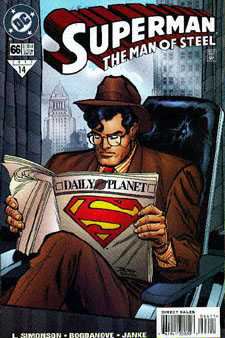 Kent's first journalism job was with the Daily Planet, where he had the honor of getting the first full length story on Superman. He has a reputation for getting many of the stories about Superman. He has won numerous journalism awards, and has published three novels. Kent's reporting has frequently gotten him into trouble. Following his series which brought down Intergang, Intergang put a contract out on him. His apartment was bombed, and Kent was presumed dead, but it turned out he had been in hiding. During the destruction of Metropolis by Doomsday, Kent was again presumed dead, missing in the rubble. However, shortly after Superman's return, he was found trapped in an old fallout shelter. Conduit (Kenny Braverman) was a childhood friend of Kent's, and, spurred by jealousy, tried to kill Kent and all of Kent's friends during his reign of terror in Metropolis. Once again, Kent went into hiding until Superman stopped Conduit. Kent is married to fellow Daily Planet journalist, Lois Lane. They live at 1938 Sullivan Place, Metropolis. They have no children. Unknown to all but a very few people, Clark Kent lives a double life as Superman. Among those who know this secret are: Martha and Jonathan Kent, Lana Lang, Lori Lemaris, Batman, Wonder Woman, Mr. Mxyzptlk, John Henry Irons (Steel) and Kent's wife, Lois Lane. At first, Kent saw Superman as no more than a disguise, a way he could use his powers while still maintaining his normal life. As time went on though, he came to see that it was not a either/or situation, but that he was a combination of both identities. His Clark Kent identity is important to him. He cherishes all his journalism awards, as awards fairly won, knowing that if the judges knew that Superman had been the author, that knowledge would have influenced their decision. It is Clark Kent who permits Superman to remain part of the people, as he can move among them as Superman cannot.